By eliminating need for workers to enter dust collector at equipment design stage, PAC Sonic Jet Dust Collectors safeguard workers from exposure to potentially harmful situations while eliminating concern for compliance with OSHA's 29 CFR 1910.146. Front loading filter cartridge array enables filter inspection and replacement to be performed by one person from outside unit with no tools. Featuring modular design, collectors come in 7 models with capacities from 12-64 filters. Newark, DE: Dust collectors designed and manufactured by automated trim and waste handling system manufacturer Precision AirConvey (PAC), Newark, Del. (www.precisionairconvey.com) feature a low-maintenance, safety-first design that places all serviceable components on the outside of the casing to permit inspections, part replacement and other maintenance to be performed without requiring human entry inside the unit. 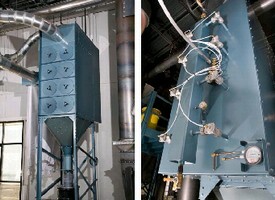 By eliminating the need for workers to enter the dust collector at the equipment design stage, the PAC Sonic Jet Dust Collectors safeguard workers from exposure to potentially harmful situations while eliminating concern for compliance with OSHA's 29 CFR 1910.146 regulating permit-required confined space entry. In addition, while traditional baghouse collectors often require workers to climb inside the unit for filter inspection and replacement, the PAC Sonic Jet Dust Collectors include a front loading filter cartridge array that enables filter inspection and replacement to be performed by one person from outside the unit with no tools by simply sliding the cartridge in and out like a file drawer. The PAC Sonic Jet Dust Collector line encompasses seven different units ranging in capacity from 12 to 64 filters. The dust collectors share a breakthrough, modular design that permits the capacity to be quickly expanded or reduced to accommodate changing processing demands. For technical information and sales inquiries, contact Chris Lavelle, Precision AirConvey, 210 Executive Drive #6, Pencader Corporate Center, Newark, DE 19702; 302.999.8000; Fax 302.266.7559; precisionairconvey.com; get-facts@airconvey.com. Fume Extraction System offers 99.5% filtration efficiency.